Non-running friends always say running 26.2 miles sounds so boring, and then they ask, "How can you run and keep your mind occupied?" My answer? People watch, especially keeping my eyes out for the crazy costumes and get-ups that runners, walkers and even spectators devise. These costume-clad folk also provide great inspiration for Halloween. So if you're still in need of a Halloween costume, especially so you don't have to whip out the same tired bunny ears or ladybug wings (that's me) for each party this year, consider these options. Heck, if someone can pull it off for 26.2 miles, surely you can wear it for a few hours. Green man. 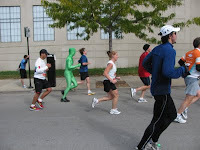 Before I read about the "Green Man" phenomenon on ESPN, he ran past me at the Chicago Marathon. Here I am, running down Wells near Chicago Ave., heading back into the Loop, and green spandex comes flying by. I say flying because this runner was totally having fun out there with his arms and legs floating out as he moved by. And I couldn't help but think he had a smart wardrobe choice on that chilly morning with the extra tights layer--but he was sweating a bit down his back and I can only imagine that navigation could get a bit tough at times, having to peer through a green screen. Cow. I swear this is one of the more popular costumes on the running path, I see at least one of these every year--maybe not always in a marathon but the cows definitely leave the pasture for one of Chicago's Halloween-themed races, Pumpkins in the Park, or the Trick or Treat Trot. Banana. This is one peel you won't have to worry about slipping on. 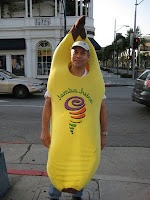 Maybe it's partially spurred by the Jamba Juice Bananaman, or maybe it's just an old promotion to see if you can run faster than a banana, but in the past I've seen pre-race announcements that encourage you to keep you eye out for banana runners on the course and to run faster than them. Some make the running look easier while others struggle to move their legs past a waddle with that peel confining their strides. Male genitalia. Not the most glamorous costume but talk about eye-catching. I didn't believe this one until Time Out Chicago found a picture of a runner sporting this get-up in the Chicago Marathon. And at the 2007 race nonetheless where the last thing you wanted was to don a costume in the sweltering heat. Bride and Groom. At the Las Vegas Marathon, brides and grooms can tie the knot at a wedding chapel along the course so it's not uncommon to see makeshift tuxes and dresses or the real thing. But you'll also spot couples donning their formal wear--or a similar shout out to wedding day attire--at other races too. Liver. Not so much costume as mascot for the American Liver Foundation, this pink, felt-like organ replica sticks out along the sidelines at several Chicago races. Soccer game. I wish I had a picture of this one, but this costume was on the Chicago Marathon course years ago and it stuck out enough for me to remember it. A man had constructed a miniature soccer game on a board game that he affixed atop his head, complete with mini players, a net and a ball. Think fuseball for a pretty accurate representation. I honestly can't remember the rest of the outfit beyond a soccer jersey I was so fascinated with the headpiece. Kitchen appliances. This image says it's based off a Threadless T-shirt that features a refrigerator running, and the more I stare at it the less real and more PhotoShop'd it looks. But a big box and some construction paper could make for a refrigerator, oven and range, or a microwave. Name That Super Hero. Superman, Captain America, Wonder Woman...if you need even more of an excuse to wear tights, the marathon is it. Plus you can wear a cape and stand out for the crowd. And if you didn't think you were super human already for running the marathon, donning the costume really solidifies the feat. Elvis. If anyone wants to shed light on the running Elvi phenomenon, please do, but Elvis jumpsuits always make an appearance on the race route. Chicago has a 5K devoted to Elvis each August, Elvis Is Alive, and at one time the Las Vegas Marathon promoted the running Elvi mixing in with the throngs of runners. This Elvis even used his jumpsuit's belt as a fuel belt. Chicken. 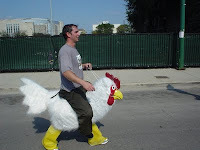 You know you can ride a pony but how about a hen? This runner tried during the 2007 Chicago Marathon, and according to the Flickr caption he didn't even see this custom-made costume until just before the race. I wonder if he kept it to wear at Halloween parties because it's too elaborate for one-time use. Yoda. Or any other Star Wars characters--Han Solo would be a relatively easy one--are always good for a costume. And like the superheroes can help to boost your spirits when you hit the wall, Yoda's fight scene moves (Episode II sticks out in my mind) can also strengthen those down miles. Plus isn't it too cool to get to carry a light sabre? The Nina, the Pinta or the Santa Maria. I couldn't believe this photo when I found it on flickr, but at the 2003 Chicago Marathon, three runners donned boats and 15th century outfits for their 26.2. Let's just hope it didn't take them as long to finish the race as it did to cross the Atlantic. Papa Smurf. 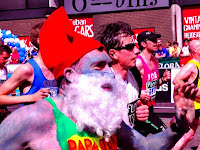 I grew up watching The Smurfs on Saturday morning TV, so when I spotted this costume from the London Marathon, it needed a call out. I recognized Papa Smurf even before I saw the blue body paint. That's a dare alright--how would that blue not sweat off? Hahah, this is really funny to find online... the Greenman was actually my brother. No way! That's awesome--I kept seeing the green man when I was running the race. How'd your brother keep covered for 26.2 miles? It must have gotten hot in there! Thanks for reading/seeing!